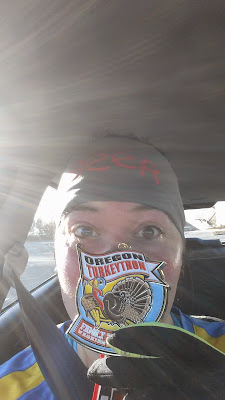 Ug, I cannot believe that I have gone this long and not posted a blog post, especially since there are TWO races I need to recap. You know the usual with me, it's been super busy, and then Eric and I were on a glorious vacation. Honestly, the last thing I wanted to do was even look at a laptop since that's my day every day. I have no problem completely unplugging from the tech devices, which is what I did! But here we are, so I'll do some recapping for you guys. 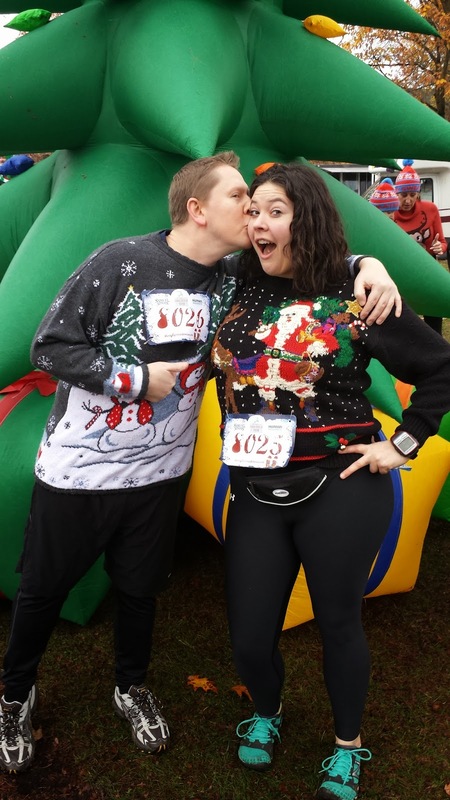 Our ugly sweater run was 2 weeks ago, and it was a nice way to start dipping my toe in the waters of the holiday season. The race was pretty close to where we live, and it was nice to be able to just drive 10 minutes away and be there! It was an interesting if disorganized race. Doing bigger races has messed with me, because once you do a few of the bigger ones where things are super organized and they over inform you of all the details involved, doing these smaller races seems a bit...chaotic. Their site didn't even have a readable course map on it, and we didn't know until 20 minutes before the race started where the finish line was. To me those are kind of major details that should be readily available, but I kept reminding myself that the race was supposed to be for fun and I just needed to let it go. We met up with our coworkers who were doing the race, and stood around and chatted beforehand and took pictures. Here are Eric and I goofing off in our sweatered glory! Actually, I didn't think his sweater was that ugly at all! There were probably about 500 people in the race, DEFINITELY smaller than I am used to! Even so, they did a staggered start, which, WTF. I mean I get having a staggered start when you have a few thousand people, but it definitely wasn't necessary for this. If I'd known, I would have definitely squeezed my way up to the front, since we were all the way in the back of the group with a bunch of women with Cadillac sized double strollers. The race itself was fine, although it was unseasonably warm and running in those sweaters became really uncomfortable really quick! I am so hot natured that I don't even wear sweaters in a normal context, so to go running in one was challenging! 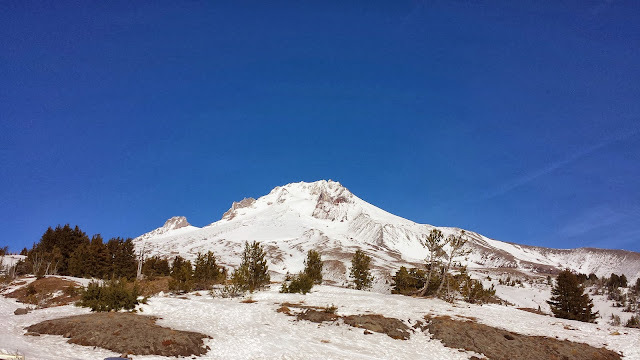 It was Eric's first time running since the Helvetia in June (he is SUCH a good sport), so I ended up hanging back with him and taking things nice and steady. I told him that he totally infuriates me because he is naturally so fast, and he barely runs! I was having to slow him down at times since I didn't want him to burn out. If he trained on a regular basis, I think he'd be an absolute killer out on any race course, but he just simply doesn't care for running. Then you've got dumpy old me who will more than likely be a slow poke for life short of some intensive speed training. The race wasn't timed, and it also wasn't a true 5k. I think my watch measured it at about 2.9 miles, and I think we finished in like 37 minutes or something. I didn't take a picture of my Gamin and am too lazy to plug it in to look and see what our finish was! My aunt and uncle live really close, so I insisted they meet us at the finish line since I knew they'd get a kick out of all the crazy people dressed up. Sure enough they were both there cheering us on when we crossed. It was probably good for them to see me cross a race finish line looking happy, since I was bawling like a maniac and limping across the finish for the marathon. We hung out with them for a bit, and then found our coworkers in the beer garden. I certainly wasn't leaving without my two drinks, especially since they were serving Angry Orchard cider...my latest fav! The after race part was fun, we literally just sat in the rain with our friends and sipped our drinks for probably over an hour while Christmas music played. It was a nice way to kind of start easing into the realization that Christmas is around the corner! The day after we got back from the cabin, we had our Turkey Trot. I have wanted to do a Turkey Trot for a couple of years now, and I've talked about this particular race a couple of times on the blog. It wasn't exactly the most exciting course, it was located at the mall, and if you did the 5k you ran 2 loops around the mall, and the 10k people did 4 loops. Again, after running the streets of Portland and San Francisco, the mall wasn't exactly my dream course, but it still ended up being a fun race. It...was...cold!!! We got up Thursday and it was 28 degrees, which is a total change from what I am used to running in. Poor Eric had to borrow one of my Bondi Bands to cover his ears as well as one of my long sleeved tech shirts (thankfully for him I like to wear men's tech shirts because they don't require you to be anorexic and flat chested). The race was not easy since I hadn't run since the Ugly Sweater Run, but eventually my body got warmed up an accepted that we were doing this. As I got towards the end, I realized that I was more than likely going to PR, which pushed me to keep running and finish strong. I was SO excited when I crossed the finish line in 1:18:59, because I knew I'd PR'd for my 10k pace. My finish time for the Helvetia 10k back in June was 1:25:02, although the heat from that day probably impacted me, but I'll take the PR! And just for fun I looked up my first 10k race (and my first race ever period), and my finish time for that was 1:47:04. I've improved slightly since then. ;) It would be nice to someday get a 10k in under an hour. i laughed at your men's tech shirt comment. :) awesome job.